In May 2016, the New Mexico Library Foundation (NMLF) funded a comprehensive assessment of all types of libraries – public, tribal school, special and academic- in the state. 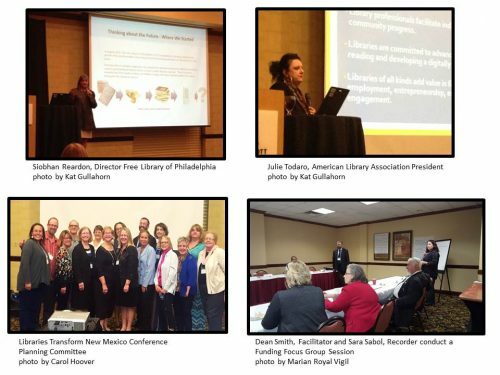 On Tuesday, November 1, a diverse group of 100 individuals gathered at the Marriott Pyramid in Albuquerque, New Mexico to discuss the results and implications of a recent statewide assessment of New Mexico libraries. Libraries Transform New Mexico: a Statewide Conference on Libraries was co-sponsored by the New Mexico State Library and the New Mexico Library Association (NMLA). The event brought together legislators, policy-makers, regional and local community leaders, agency representatives, librarians, librarian advocates and library users to reflect on the state of all New Mexico libraries, to celebrate their accomplishments, and to make recommendations for addressing challenges that confront both libraries and their communities. The conference began with welcomes and announcements from Kathleen Peiffer, New Mexico State Librarian; Sharon Jenkins, President of NMLA; and Secretary Veronica Gonzales, New Mexico Department of Cultural Affairs. Following an outstanding performance of inspirational poetry by Albuquerque Poet Laureate Manuel Gonzales, Siobhan Reardon, Director of the Free Library of Philadelphia kicked off the conference with a keynote address entitled “Libraries: What’s In Our Future?” Ms. Riordan challenged conference attendees to think creatively about opportunities for redesigning and redefining the state’s libraries by cultivating new and diverse partnerships for funding and developing new programs and services that are responsive to community needs and interests. She also urged librarians from all types of libraries to embrace the reality of shrinking public funds and to take charge of their budgets by finding ways to earn income and increase private contributions. Libraries Transform New Mexico was designed to be a working conference, so the majority of the day was spent with participants divided into focus groups to discuss three broad topics, which were developed from the statewide assessment findings: 1) Funding, 2) Technology and 3) Collaborations/New Roles. Each topic was discussed by four different groups throughout the day. The groups were tasked with briefly reviewing relevant assessment findings, then crafting three recommendations for resolutions and/or next steps to address these results. The groups were also asked to identify and report one interesting, unique or exciting idea or concept that emerged during discussions. After the focus groups concluded, these recommendations were shared out with the entire gathering and some clear threads emerged. New Mexico’s libraries are still vibrant and dynamic and effectively engaged with the populations they serve. Increased and more stable funding is needed and new partnerships and private donors need to be cultivated to close the increasing gap between financial need and public funding. Early childhood literacy is vital to New Mexico’s citizenry and libraries of all types are contributing and will continue to contribute to programs addressing that need. Technology infrastructure, including broadband access, is not robust throughout the state and, in some cases, is non-existent. Partners and resources, including e-rate funding, need to be embraced to address this baseline need before more programs and services can be delivered to all sectors of our state. Many interesting ideas were shared, including the idea of providing hotspots on school buses to be used by students when riding to and from school, and then parked near libraries or other community areas to be used by the general public during the remainder of the day. American Library Association (ALA) President, Julie Todaro provided closing remarks, including a summation of the day’s work and with an emphasis on linking the state conference to the national Libraries Transform campaign. Todaro noted that “Libraries today are less about what they have for people and more about what they do for and with people” and emphasized five key areas — education, employment, entrepreneurship, empowerment and engagement—where libraries of all kinds add value. She encouraged librarians to gather and learn to tell their stories of success and inspiration, something the conference sought to implement by soliciting and displaying the transformative stories contributed by New Mexico libraries prior to the conference. Todaro gave suggestions for partnerships and next steps, including adopting more aggressive marketing for library bonds engaging more actively in the pursuit of alternative sources of funding. She urged the development of products and other deliverables to serve individual constituents as well as the broader needs of local, regional and state communities. She also talked about her unique use as ALA president of the Association’s Libraries Transform campaign, calling hers the Libraries Transform: the Expert in the Library campaign. She encouraged librarians of all types to rebrand themselves as resident experts and to look for ways to apply their expertise to the matter of supporting their constituents and transforming their communities. Mike Delello, Deputy Secretary of the New Mexico Department of Cultural Affairs closed out the day with a promise of action on the recommended next steps and a call for working groups to continue the work started at the conference. Future activities will include: working with New Mexico legislators to craft and carry into the 2017 session, resolutions and bills designed to address the identified needs of libraries, continuing conversations with librarians on moving New Mexico libraries and communities forward at NMLA’s spring conference in Las Vegas, New Mexico, and pursuing professional development and continuing education workshops on funding and advocacy for the purpose of cultivating new sources of earned income for libraries. 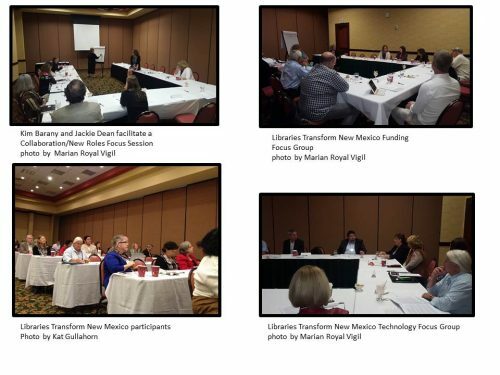 Libraries Transform New Mexico was a huge success due to the vibrant participation and commitment of all who attended and to the financial sponsorship of various corporations, library Friends groups and individuals. 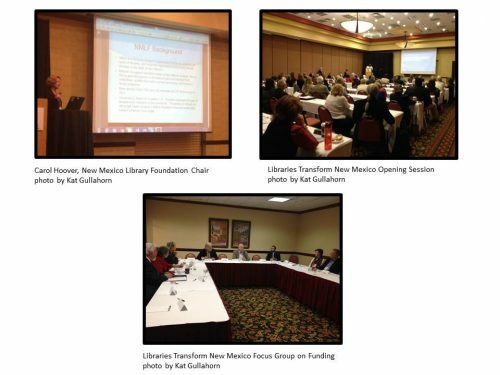 Links to conference presentations and documents, including recommendations and next steps from the focus groups can be found on the Libraries Transform New Mexico website at https://sites.google.com/site/librariestransformnm/.